I absolutely the community of ladies that I have gotten to know this past year and they are so creative! this year I participated in the Will You Be My Valentine Exchange for our kiddos! All you had to do was create a fun Valentine and send them all over the country! 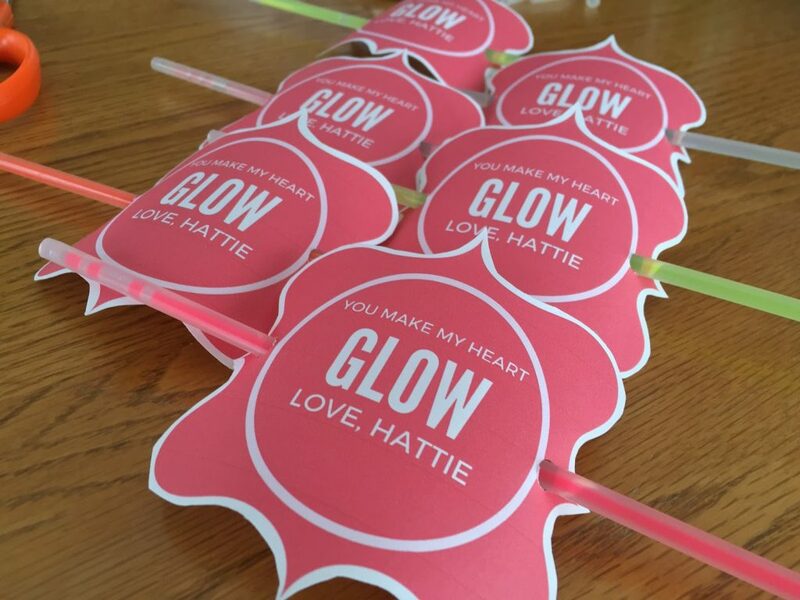 Yesterday, I shared with you a fun Valentine’s Day Printable using glow sticks. Well this was our Valentine for the swap. The other thing I loved doing this year was displaying all of the adorable Valentine’s! I took a cue from how I hang my Christmas Cards and bought adorable wired burlap ribbon with hearts all over. I used about a 3 foot piece and wrapped over my cabinets so they would be on display and (bonus) out of reach of little fingers. I just secured the ribbon with packing tape and used clothes pins to secure each individual Valentine. How cute! Be sure to check out all of the awesome bloggers in our Valentine Exchange! So much creativity. Miss H loved opening everyone and trying to eat all the snacks! I love how you displayed them!! I had to hide ours so Cam didn't use them all immediately! I love the way you displayed these! And it's so fun seeing pictures of our Valentines scattered across the country! I love your display!! So cute! My kids ripped into the candy and cards so fast I barely had time to get photos. There's no way I could hang up M&Ms without having to listen to "Can I have those?!!!" a million times a day!! yeah I'm also impressed with your hanging up of the mnms. The glow stick ones are super cute. I'll have to keep that in mind for classroom valentine's! The glow sticks were such a great idea! So cute! Aww, yours were cute!! For some reason we never received yours. Darn postal service! I love how you displayed them. I love how you displayed them! And we had lots of fun with our glow sticks last night!! Kinsey was SO bummed the glow stick didn't work! Cute display! Loved yours!! The glow sticks were a huge hit at bath time!! We loved yours! Mason loves playing with glow sticks in the bath so it was a huge hit. Did you get ours? I didn't see it hanging but maybe it was just too heavy to hang? Just checking! Cute printable! And I love your idea for displaying the Valentines. I think I'm going to do that in my classroom, it will make the kids feel so special if I put their valentines on display. What a cute way to display them all! And glow sticks are always popular! For some reason I don't think we got yours though :(. That post office sure is crazy! So many fun Valentine's! What a great idea!